Have a chlorinated or non-chlorinated solvent, gasoline, diesel, jet fuel or mixed waste plume (including free product) under a road, highway, mall, shopping center, farm, airport runway, refinery or commercial, industrial or residental building? We can help. We have designed hundreds of highly successful remediation systems employing directionally drilled (horizontal) wells to access and clean up contaminated soil and groundwater under every conceivable obstruction, while activities above ground progress completely unimpeded. Our unique approach to site cleanup allows every Client to continue his business activities above ground without any disruption or loss of revenue. Each of our systems are entirely unique, and completely account for every detail of the specific site, the contaminants of concern and the underlying geology. Our gas and air-based systems completely encapsulate all contaminated soil and groundwater in 3-D from the bottom up, ensuring that no further contaminant migration is possible, no matter what event, manmade or naturally occuring, may take place. 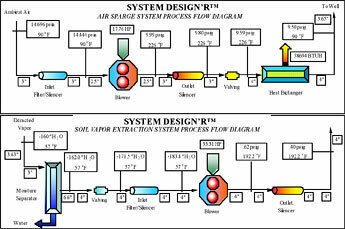 Using our one-of-a-kind suite of 11 remediation system design and performance predicting computer programs, we can design and predict the exact performance of any horizontal well gas injection or extraction system, including Air Sparge, Biosparge, Soil Vapor Extraction, Two-Phase Bioslurp Extraction, and Hot Air and Steam Injection systems. One individual correctly designed, constructed and installed horizontal well remediation system can replace up to a hundred or more traditional vertical wells, and offer far better performance at a fraction of the cost. How do we know? Because we hold the world’s record for implementing the two longest and largest fully functional Air Sparge remediation systems employing horizontal wells, each well being ¼ mile long and each system treating a footprint of nearly 10 acres! Since 1992, with the creation of our proprietary SPARGE™ computer design and modeling program, developed specifically to design and analyze horizontal well remediation systems for the Environmental Industry, Integrity Engineering has been on the leading edge of new technology. SPARGE™ represents the first true Finite Element Analysis (FEA) Computational Fluid Dynamics (CFD) modeling and analysis program capable of precisely designing and predicting the performance of any slant or horizontal Air Sparge or Biosparge well and system. With its sister program EXTRACT™, our proprietary FEA CFD design and modeling program for horizontal well deployed Soil Vapor Extraction systems, we offer our clients the capabilities of designing in-situ treatment systems to remediate a wide array of contaminants and mixed wastes in extremely hard to access locations. Our talents, and computer programs, are unique – no other company in the United States possesses these talents or these programs. Does your well need to undulate up or down (or up and down) to miss underground interferences? No problem. Does your well need to traverse through multiple soil types? No problem. Does your well need to undulate up and down, traverse through multiple soil types and have zones of more or less injection or extraction flow to optimize remediation and minimize fugitive vapor generation under roadways, occupied buildings, and through source areas? No problem. Our FEA programs (and only FEA computational techniques) can handle these complexities with ease. Our unique talents allow us to perform What if? analyses on any system design to determine the change in system performance should any of 19 different parameters change. What if the water table rises 10 feet? What if it drops 5 feet? What if the soil permeability is 10 times that thought?What if it is half? What if I double the length of the well? We can readily answer these questions, and more, at will. Our extremely robust computer programs permit us to design, redesign and change any soil, groundwater, or physical design parameter at will, and calculate the resulting affects immediately – we can tell our client the answer to any What if? questions the very same day we are asked! With our DISPERSION™ in-situ air/gas fate and transport modeling program, we can determine the exact length, width and breadth of underground aeration in 3-D of any air injection well, horizontal, slant or vertical. DISPERSION™ completely eliminates any guesswork in trying to determine exactly where to place treatment wells, how deep, and how closely spaced. A typical horizontal air sparge well can cost upwards of $50,000 or more – installing too many is very expensive and wasteful, install too few and the contamination will never clean up. DISPERSION™ solves these inherent problems, resulting in perfectly placed wells, positioned to maximixe remediation effectiveness and minimize treatment cost. All of our computer design and modeling programs interact with each other allowing us to design and specify the treatment system piping, valves and equipment that precisely matches the requirements of each well – there is no guesswork deciding what to order. Equipment performance is automatically specified by manufacturer, size, model, motor size, and speed. Corresponding operational energy needs are minimized – there is no waste. We lead the industry in designing and deploying environmental remediation systems that are 100% “green”and which are extremely efficient, resulting in the absolute best performance possible at the least cost. Have an existing treatment system that isn’t performing as required or desired? We can help. Having encountered numerous clients unhappy with their existing treatment system’s performance, we have developed forensic skills to evaluate and optimize the performance of any environmental remediation system. Using special tools, techniques and our VAPOR™ system analysis program, we can forensically evaluate any system and determine its exact performance. We can then reverse engineer the system using our FEA CFD programs to determine what maximum performance it is capable, and then direct the client to take precise steps to optimize his system’s remediation effectiveness. We have forensically evaluated and optimized scores of malfunctioning, or less than stellar performing remediation systems, saving our clients tens of millions of dollars as a result. We periodically post white papers that provide in-depth discussions about our programs, as well as other pertinent industry topics. Please click the link to Technical Papers to review these documents. For more information concerning each of our proprietary computer modeling, design and analysis programs and how we may be of service to you, contact us at 610-692-7650.